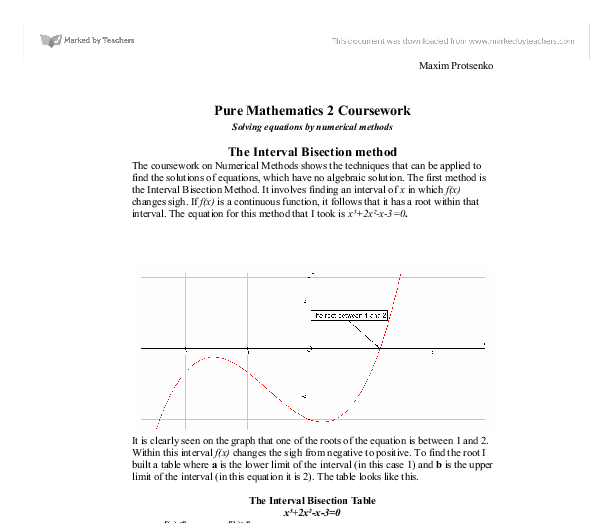 The coursework on Numerical Methods shows the techniques that can be applied to find the solutions of equations, which have no algebraic solution. The first method is the Interval Bisection Method. It involves finding an interval of x in which f(x) changes sigh. If f(x) is a continuous function, it follows that it has a root within that interval. The equation for this method that I took is x³+2x²-x-3=0. It is clearly seen on the graph that one of the roots of the equation is between 1 and 2. Within this interval f(x) changes the sigh from negative to positive. To find the root I built a table where a is the lower limit of the interval (in this case 1) and b is the upper limit of the interval (in this equation it is 2). The table looks like this. , for a root of f(x)=0. Then drawing the tangent to the curve y=f(x) at the point ( , f( )). 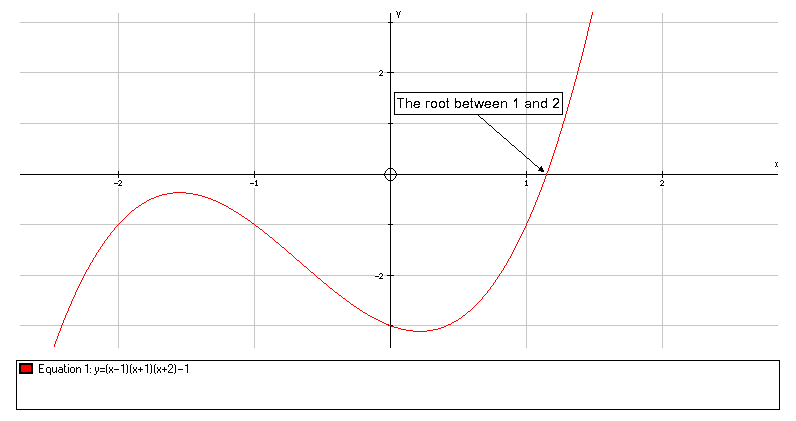 The point at which the tangent cuts the x axis then gives the next approximation for the root and the process is repeated. The equation I took for this method is x³-7x+1=0. y-f( )=f ‘( )[x- ]. 0 -f( )=f ‘( )[ - ]. f(x)= x³-7x+1=0 and f ‘(x)= . The Newton-Raphson method gives an extremely rapid rate of convergence. The first root of the equation I found is 2.571201 with the error bounds of 2.571200<x<2.571202. But despite of this it takes lots of time to obtain one root and would take ages to do it without any computer or graphic calculator aid. 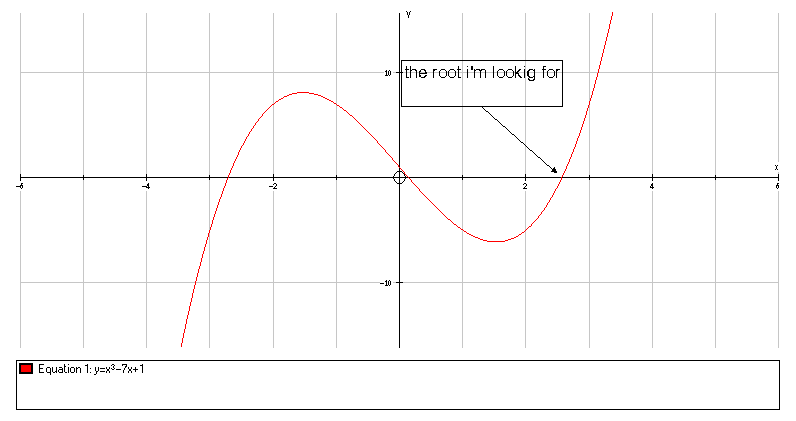 Also the initial search may miss one or more root, for example when the x-axis is a tangent to the urve or when several roots are very close together. Newton Raphson method is the easiest way to estimate the root and takes much less time than to estimate the root using the first method. It doesn’t take that much time but it can go wrong very quickly and jump to another root. And the last method rearranging is the hardest one. It takes plenty of time to rearrange the equation and then to estimate the root. And it’s very likely to do something wrong using it. In conclusion I can say that the most efficient and easiest way for me to estimate the root, was the first one, because it takes not so much time if you get used to it. Very useful were PC programs such as Excel and Autograph. And at last the fact that in excel it is easier to change one equation on another and to get other roots, I can definitely say that it is the best method for me. C3 Coursework - different methods of solving equations. predict the real consumption getting better as the more factors added in the function. However, there are still some problems exist. The first one is that the lag structure is too simple to represent the real world's consumption. In addition, consumer's consumption behavior is different when they buy different type of goods. 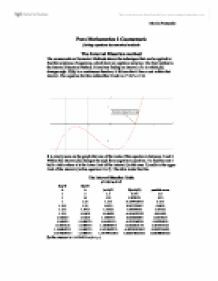 This coursework is about finding the roots of equations by numerical methods. The following table was constructed using a Microsoft Excel spreadsheet with the formulae displayed, again applying the iterative formula: xr+1 = xr - f(xr) The values obtained are as follows: It is evident that the 'new x value' tends towards 0. Three ways of reading The Bloody Chamber. And that the alternative to this kind of significance is the life of a petit bourgeois. When the mythic fails, there is nothing left but the mundane. The third level of semiological analysis can I think, defuse the feminist concerns about the picture of female sexuality that is presented in The Bloody Chamber.